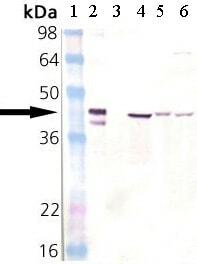 This antibody detects a ~40 kDa protein, corresponding to the apparent molecular mass of Hsp40 on SDS-PAGE immunoblots. It does not detect DnaJ in E.coli lysates. Our Abpromise guarantee covers the use of ab69402 in the following tested applications. WB 1/10000. Detects a band of approximately 40 kDa (predicted molecular weight: 38 kDa). Cytoplasm. Nucleus. Nucleus > nucleolus. Translocates rapidly from the cytoplasm to the nucleus, and especially to the nucleoli, upon heat shock. Immunocytochemistry/ Immunofluorescence - Anti-Hsp40 antibody (ab69402)This image is courtesy of an Abreview submitted by Dimitra Kalamida. 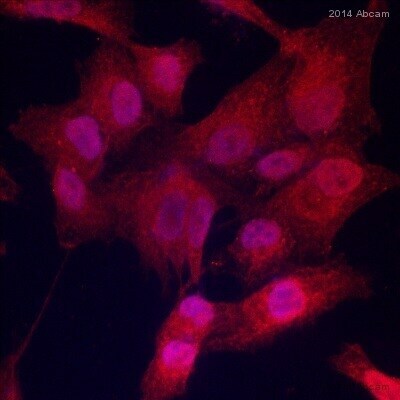 ab69402 staining Hsp40 in the A549 human lung cancer cell line by ICC/IF (Immunocytochemistry/immunofluorescence). Cells were fixed with paraformaldehyde, permeabilized with Triton X-100 0.1% and blocked with 5% BSA for 20 minutes at 20°C. Samples were incubated with primary antibody (1/200 in PBS) for 1 hour at 20°C. A CF568-conjugated Donkey anti-rabbit IgG (H+L) polyclonal was used as the secondary antibody. Publishing research using ab69402? Please let us know so that we can cite the reference in this datasheet.